Looking for somewhere to place your beautiful cakes and bakes? Need a cupcake/cake stand for a special occasion? Well, you can rent cupcake/cake stands here! Rented cupcake/cake stands must be collected and returned to our location by appointment only and cupcake stands will not be shipped. Do contact us for further details of the collection location and timing if you have any enquiries. 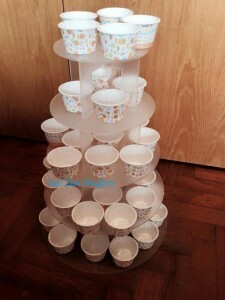 If you want to buy disposable cupcake stands, do so here! 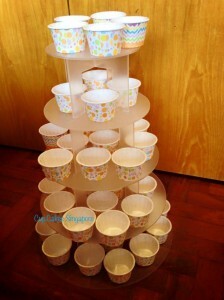 You are able to customise how high you want your cupcake stand to be. Just let us know what you want to put on it and let our friendly staffs assist you. Round cupcake/ cake stand perfect for weddings, birthday parties, bridal showers, anniversary parties or just to display your beautiful cakes. $150.00 refundable deposit required per order. This $150.00 will be refunded to the Customer once the goods are returned undamaged and in the same state as when it left our premises. $40.00 for rental of cupcake stand for 2 days. If you are ordering our cakes/cupcakes, rental fee is only $30.00. Once you have decided to rent our cupcake stand, give us a call or email us your order. We will confirm your order and get back to you via email with the address for pickup. A full refundable security deposit of $150 is required when the rental agreement is made. This will be refunded to the Customer once the goods are returned undamaged and in the same state as when it left our premises. Responsibility for the rented cake stand remains with the Customer during the hire period, from the time of collection to the time of return. Items are not to be left at unattended premises. All items must be collected and returned to our location within 2 days. Should the hire items be held for a longer period (more than 2 days), the Customer will be charged a full day’s rental ($40.00) for every additional day. Before returning the goods to us, please ensure that they are gently washed and cleaned. Use a clean cloth to remove grease and dirt from the cupcake stand before returning as food stains can cause mould which is hard to shift. A cleaning fee may apply for heavily stained items. Please do not use lit candles on our cake stands as the wax may cause damage. Should an item become lost or damaged, the Customer will be liable for reimbursing us for the full cost of replacement or repair (if this is possible). Please contact us immediately about any loss or breakages. Cancellations made 7 days prior to the pick up date will receive a full refund. Cancellations made within 7 days will forfeit the payment. Please refrain from sticking anything onto our cake stand. Cup.Cakes Singapore is not held responsible for any injuries caused byte any person or damage caused to any property of the Customer resulting from the hire of our cake stands.